Sad news, Joop Valentijn, a well known Dutch father in Kumasi passed away on August 19th, 2014 after a period of sickness. Father Joop Valentijn was one of the First ambassadors of the SmartKids approach and -philosophy in Ghana. He was an important force in establishing the Ghana part of our Foundation. He was one of the four founding board members of the Smart Kids Foundation Ghana at the time it was established in June 2005. Father Joop worked and lived more than fifty years of his life in Africa, of which more than fourty in Kumasi, Ghana. 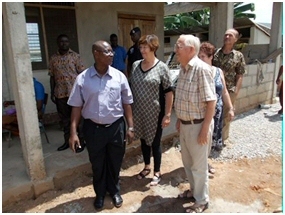 Furthermore, he was instrumental in setting up the link, as sister cities, between Almere in Holland and Kumasi in Ghana. This initiative developed into a warm corporation between both cities. Father Joop Valintijn, rest in perfect peace, you will be missed in many ways and at many places.